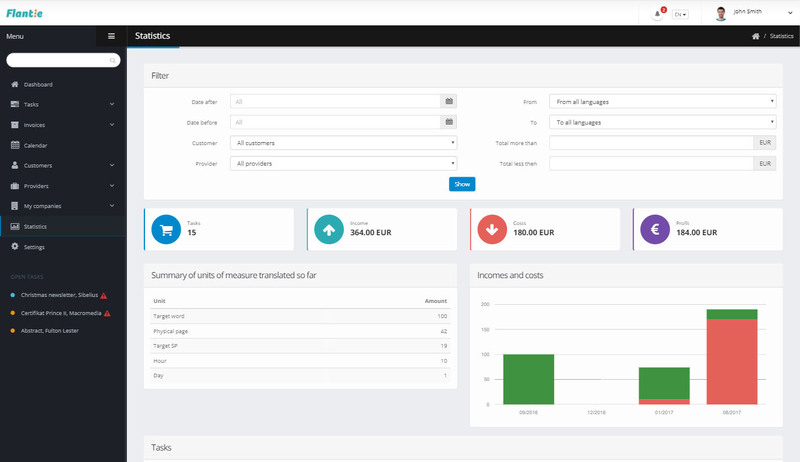 Flantie is an online project and invoice management system for translators and interpreters. It’s easy to use, try it yourself. With Flantie you can create your own customer and provider database – with easy updates. The application allows you to easily create your main price list, as well as separate price lists for customers and providers. 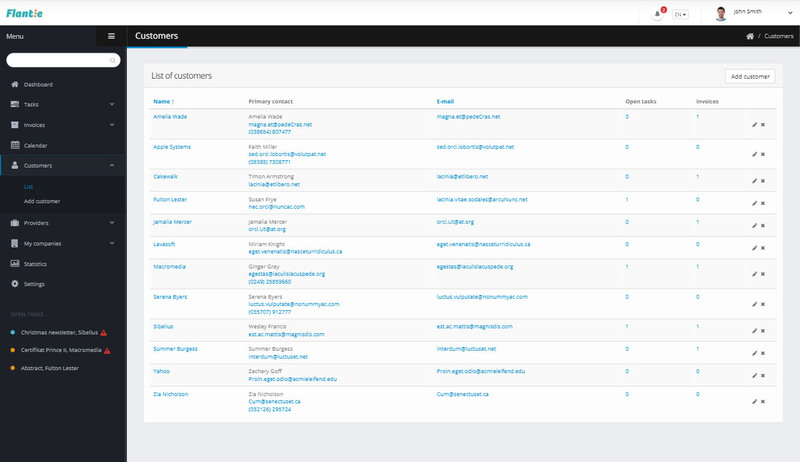 Service rates are conveniently stored in one place – no more trawling through email history. 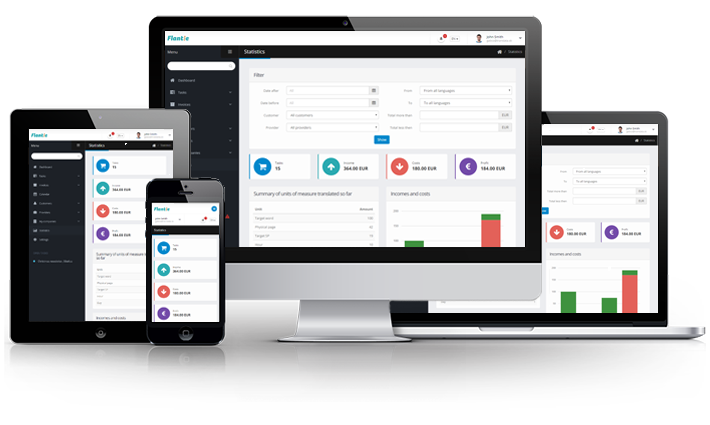 With the Flantie database, you can manage individual contact and invoicing details and create separate price lists. You can outsource whole or partial tasks (proofreading, DTP, etc. ), and the Flantie application will track deadlines and send notifications. With Flantie you can create new projects for individual customers. 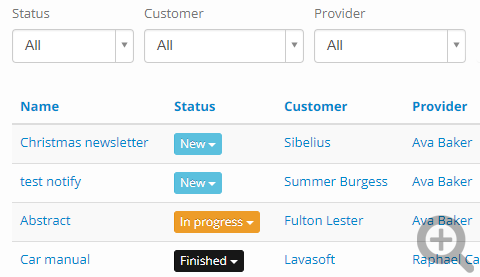 The application automatically fills fields based on previous customer/provider details. Complete project cycle management saves you time and money – so you can focus on core services. Easily monitor invoice payments with Flantie. 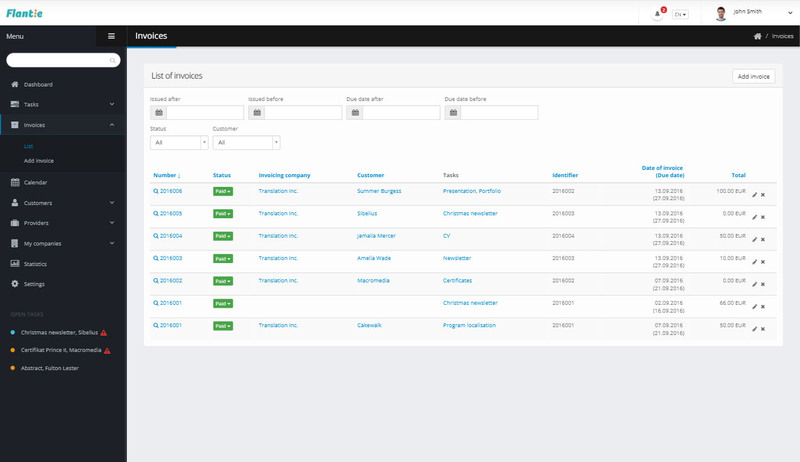 Non-invoiced projects are listed for separate or cumulative invoicing. The application alerts overdue invoices, and allows data export for accounting and tax purposes, and for external accounting systems. 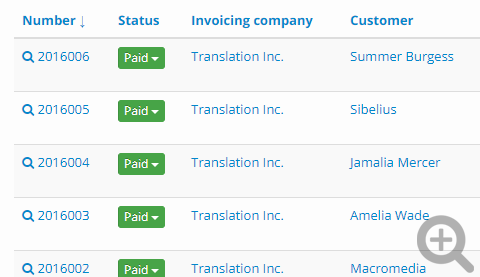 Several invoicing companies (VAT payer, non-VAT payer, trade license, certified/sworn translator)? 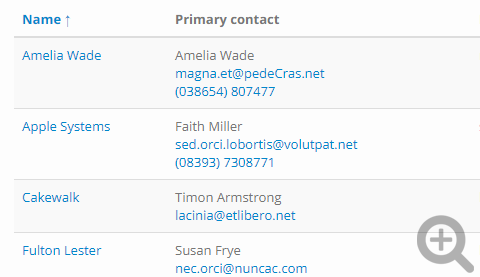 When creating new projects or invoicing, just select the appropriate invoicing details from the database. 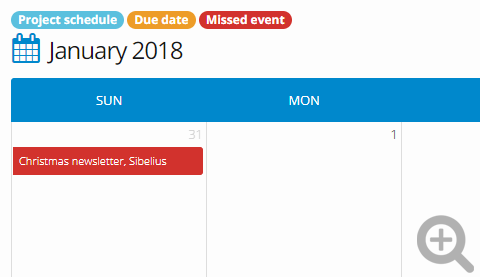 All confirmed projects, meetings, due invoices, and delivery deadlines (incoming and outgoing) are added to the calendar – automatically. 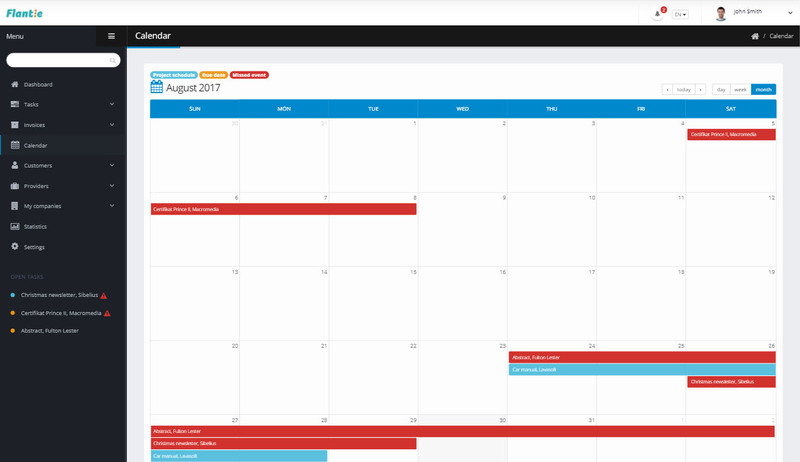 The Flantie application monitors deadlines and alerts upcoming events. 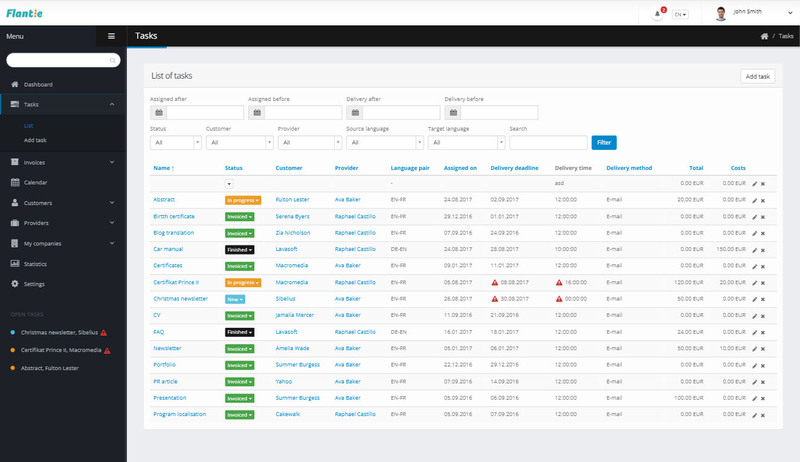 Flantie processes data and displays comprehensive filtered statistics – allowing you to analyse relevant data and plan your strategy to increase revenue and optimise workflow. Most database stats can be exported. For example, you can export invoices and use Flantie primarily for project management and records, while using your preferred system for invoicing. 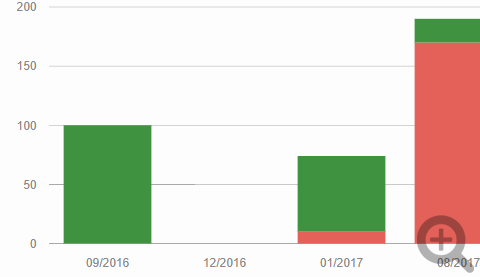 I have so much work that I often forget to invoice tasks. Thanks to flantie I can always see which tasks I have to invoice! Great application! It allows me to track all my assignments. Notification feature is perfect! I am working on huge amounts of short assignments and finally I can keep track of them all and make sure none is forgotten at the end of the month when I invoice all of them. Flantie is so quick and easy which is great because I really hate complicated things. Anything to recommend, want to point out a bug, request a specific feature, or just say hi? We look forward to hearing from you – simply use the contact form below.